The daughter of Carly Simon and James Taylor, Sally Taylor has been making music since she was fifteen. But it wasn't until she met up with another singer/songwriter, and future co-producer, Wendy Woo, that she actually decided to put her music to tape. 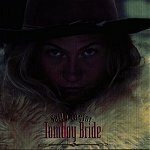 TOMBOY BRIDE is the end result, a folk-rock album that sails free, incorporating the folk and pop-rock influences as well as some jazz sprinkled in here and there. Setting the mood for the whole album, "The Complaint" is led by the soft sounds of the piano. As the notes dance around the song, and Sally's soft, lovely voice flows along, you know this is going to be a very relaxing, smooth album full of passion and beauty. And that is just what you get. "Strangest of Strangers" bounces along with a pop touch, flexing the rock part of the song, while the light feel of the song calls upon the folk part. Then there is "The Good Bye," a jazzy lounge number that steps far away from the folk-rock that composes the majority of the album. However, Sally, with her comforting voice and careful feel, makes it work. The soft, relaxed lounge feel sits perfectly next to that of her easy-going folk compositions. "Sign of Rain," "In My Mind," and "Alone" all possess the tender folk that fills this album with so much heart and soul. "Tomboy Bride," a live recording, features just Sally Taylor, her acoustic guitar, and her voice -- making it one of the most open, heart-on-the-sleeve tracks on this disc. It is pure and innocent, sweet and caring, yet confident and free. With Sally's golden voice leading the way, and the soft twinkle of the guitar, I instantly fell in love with this song. Easily my favorite on this disc. Of course, what would this album be without an appearance from Sally's dad, James? "Unsung Dance," a hidden track (yet the lyrics are included in the booklet) features James Taylor on guitar and Sally on vocals. An eloquent ending to a very nice album. Sally self-released this CD and wasn't even concerned with distribution or promotion when she did, which are the key elements of success. She was just content with having the album available at live shows and having fun playing the songs out. This album is full of spirit, fun, and emotions. I'll give it an A-.